Power to negotiate contracts: Are you “too big to fail” or do you “fail to be big”? On the 12th of April 2019, I had the pleasure to participate to an event organized by CIArb in partnership with the LL.M Business Law, Arab World and Middle East of Université Paris 1 Panthéon-Sorbonne. This article gives some feedback on the event. I was speaking with Howard Carsman who is the Global Construction Claims Manager at Intel Corporation on the innovative ways that Intel is using to avoid conflict on its construction projects. One year of AfiTaC’s contract management blog in the Project Businesses (Infra & Construction, Renewable & Power, Special Equipment Projects etc)! Time to put ourselves in question. 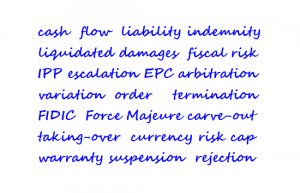 Bank rating clauses, a blessing or a curse in Project contracts? 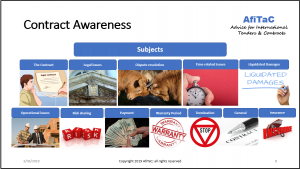 A bank guarantee “rating clause” is an objective way to guarantee the quality of the Performance Security to Employers (and Lenders in Project Finance). But are we missing something? Let’s look at it in further detail in this article. 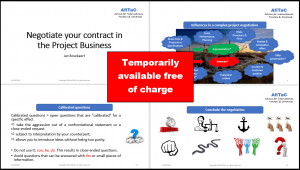 In our world of the Project Businesses, we reflect on negotiating the payment terms in contracts for Complex Projects. How to prepare? How to act? How to conclude? This will enable, both Contractors and Employers, to prepare for the unavoidable discussion about when to pay. The techniques are transposable to other negotiation situations. Getting out of a “take it or leave it” situation smoothly? What can you do if you are confronted with a “take it or leave it” offer? Here is some important advice from Chris Voss, the man who learned to negotiate in a practical way at the FBI. Rehabilitation and EPC philosophy, are they compatible? I’ve received a very interesting question: Can the EPC philosophy be applied to rehabilitation projects of, for example, a power plant? In this article, you will find my answers with the reasoning behind it. Mediation, do you want to know the latest status? An event organized by the Young Members Group of CIArb named “Arbitration & Mediation at a Crossroads” enabled us to reflect on the positioning of mediation within the spectrum of dispute resolution methods. Why pleadings are not negotiations… are they? Negotiators may fall in a “pleading mode” when doing their commercial negotiations. Lawyers may not see their pleadings in court or in front of a tribunal as negotiations. By making a parallel between pleadings and negotiation in this article, both negotiators and lawyers can learn and improve.